6 Month Smiles is a fixed brace that provides fast results through an effective and comfortable treatment process. How are results achieved in just 6 months? The brace focuses on the teeth that you can see when you smile, thus removing the need for other timely tooth movement. The teeth to be treated are fitted with tooth coloured brackets and wires, offering patients a highly discreet treatment route coupled with effective tooth movement. This treatment is ideal for patients who desire quick results in time for a special occasion such as a wedding. How are 6 Month Smiles Braces Fitted? The braces are created based on impressions taken of your teeth. The 6 Month Smiles tooth coloured braces will be attached to the front of the teeth with dental cement. A wide range of tooth irregularities can be treated with 6 Month Smiles including crooked teeth, tooth gaps and twisted teeth. It is suitable for mild to moderate conditions, but more complex problems may require alternative treatment. During an initial consultation we will examine your teeth and bite to see which brace is most suitable. 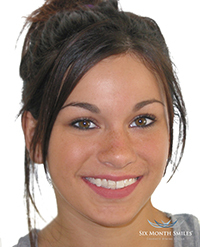 The braces are extremely discreet compared to traditional fixed braces. They are able to achieve fast results and treat a greater range of problems than many removable aligners. They only focus on the teeth visible when you smile and can straighten teeth in just 6 months. Month Smiles is the perfect treatment for patients who want a beautiful smile in a short amount of time.